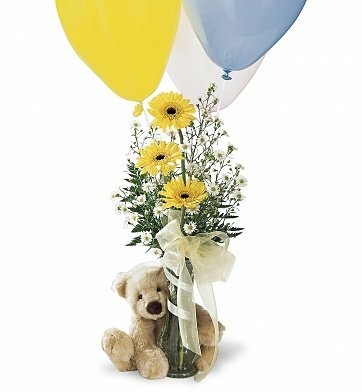 A sweet-faced, plush soft teddy bear arrives with this vase of yellow mini Gerbera daisies and white Monte Cassino. Three cheerful latex balloons are included to celebrate the new baby girl or boy. Arrives in a sparkling clear glass vase. Measures approximately 19"H x 7" W.
Welcome to the World is a hand delivered gift. These gifts are delivered by one of our local design centers located throughout the United States and Canada. Same day delivery is available for most gifts when ordered before the cutoff time. The cutoff time for Welcome to the World is in the recipient's time zone. I ordered "Welcome to the World" for a close relative who recently had a baby. I was a bit disappointed that the arrangement delivered was not at all like the picture posted on the website. Instead, it was a mid-sized basket of wild flowers and a smallbear WITHOUT the card ... on which I had prepared an inside joke for my cousin . However, the flowers were beautiful and smelled absolutely amazing. That relative and other family members LOVED the gift anyhow.